Alexander Naysmith – or “Nasmyth”, as his name is also spelled – was an artist and engineer, born to a family who for generations had been working in close contact with the government, the professional classes, and the aristocracy, building some of Edinburgh’s main houses and re-modernising old castles. His father began training him in the same profession, but he showed a determination to take up the artistic profession. He briefly studied under Alexander Runciman at the Trustees’ Academy. Then in his teens he caught the attention of Allan Ramsay, who took him to London to work in his studio. A few years later he returned to Edinburgh, where he began his profession as portrait painter; his early works were naturally reminiscent of Ramsay’s techniques, but he soon developed his own personal artistic traits and, compared with Ramsay, dedicated more importance to the background of his portraits. In 1782 he left for the Continent, as was typical of artists of the time; he returned two years later. Several people think that Allan’s likeness of me is more striking than Nasemith’s, for which I sat to him half a dozen times. (G. Ross Roy, The Letters of Robert Burns, vol. II, p. 356). 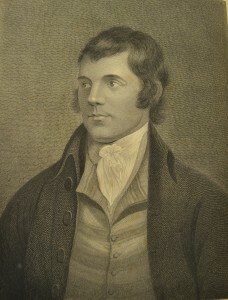 Naysmith lived close to the poet when he was in Edinburgh, and often walked around the city in his company. Naysmith and Thomson also produced a smaller version of the portrait for the octavo edition of George Thomson’s collection. It is essentially the same as the one provided in the folio edition, with the addition of a natural landscape in the background. With Raeburn taking the scene of portrait painting in Scotland by storm, Naysmith later decided to focus more and more on landscapes, and less on portraiture. 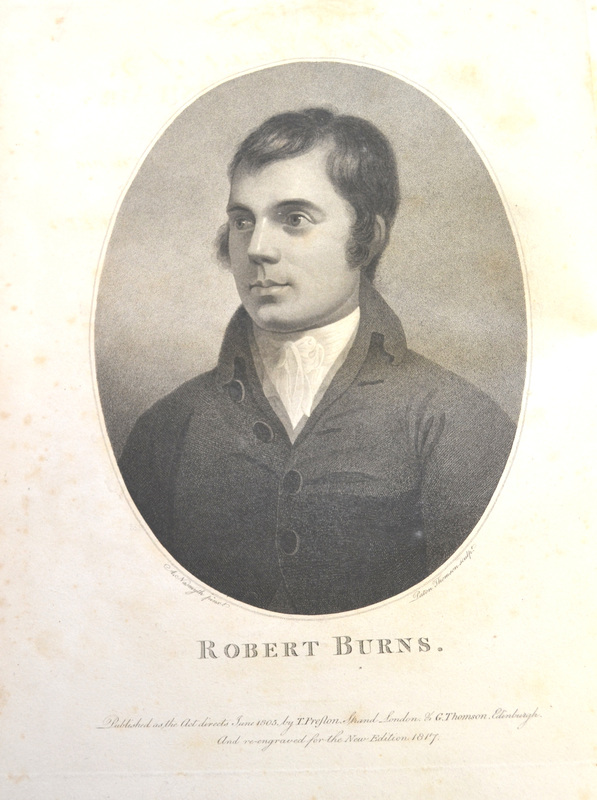 It is also possible to find a rectangular engraving; Burns’ hair is slightly longer, and the background quite a bit darker. 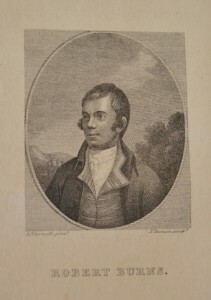 This portrait is drawn by Archibald Skirving, after Naysmith, and it is engraved by Paton Thomson. The engraving was possibly sold separately, as it does not appear consistently in the publications. Not all versions of this portrait bear the names of the authors: this one in fact has no author specifications at all, but we know the details thanks to other copies of the portrait such as the one held at the Morgan Library & Museum in New York. Naysmith’s marriage produced twelve children, many of whom became artists. He was a successful teacher of the arts, and some of his students include David Wilkie, William Allan, Andrew Geddes, and John Thomson. He did not abandon the engineering trade which ran in the family, and provided designs, for instance, for bridges, mansions, a lighthouse, tunnels, and follies. He lived a full and busy life, and successfully engaged in many strands of the arts.